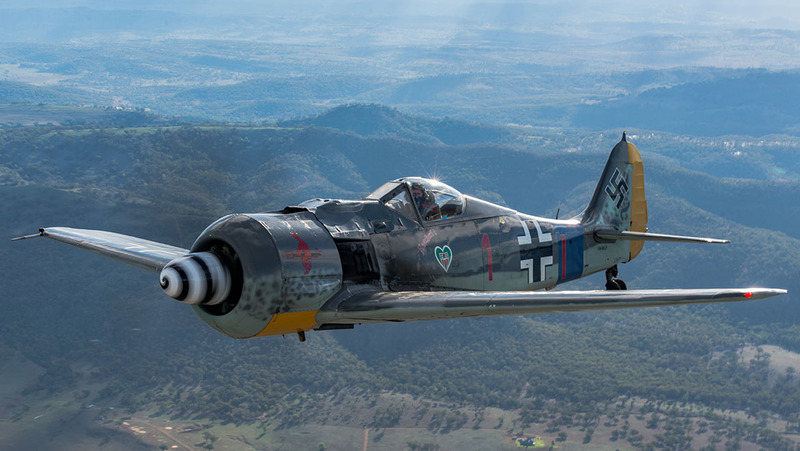 As a youngster with an aviator father and a passion for flying, Chris Mayr made scale models of German World War 2 aircraft and dreamed of one day owning and flying one in particular – a Focke-Wulf Fw 190. And now he has. A mainstay of the Luftwaffe throughout the war, the Fw 190, named Würger (shrike or butcher bird), is a low-wing fighter, powered by a giant BMW radial engine and able to mix it on terms equal or better with allied Mustangs and Spitfires right through to the end of the war. “The Focke-Wulf just appealed to me. It is one of those very aggressive designs and I took to it at a young age,” said Mayr, whose day job now is flying Boeing 737s for Virgin Australia. So why not the Messerschmitt Bf 109, the most common German WW2 fighter? “I love them all. The Focke-Wulf was always my favourite. It was certainly the one I drew the most in my school books and built the most models of,” he said. The flying bug bit early too. “Dad was and still is a private pilot. He came to Australia in 1961 and started flying powered aircraft at Casey Airfield in 1971 and gliders around Albury in 1974,” he said. Mayr said his passion for German equipment, which extends to German cars and the family’s pet Dachshund ‘Sizzle’, probably stemmed from his German heritage, with his father born in Stuttgart, Germany in 1940. Chris Mayr and his father pose in front of VH-WLF. “He remembers growing up in wartime Germany and having to hide in air raid shelters as a child. He used to tell me stories about them hiding Focke-Wulfs and Fiesler Storches and things in the Black Forest and covering them with netting and branches. So I have always had a fascination with German military equipment,” he said. He officially learned to fly in a Cessna 172 and was licensed at 16, then embarked on a flying career, initially flying tourists around Ayers Rock and freight down to Tasmania. From there he joined Rex flying the Saab 340 before landing a job with Virgin. After five years on the Embraer E190 he moved on to the 737. Along the way, Mayr acquired a Yak-50, an uncompromising Russian-built aerobatic aircraft. But the desire for a Focke-Wulf never faded. This aircraft stemmed from a design competition for a new fighter run by the German aviation ministry in the mid-1930s. The Messerschmitt Bf 109 was the outright winner but the ministry prudently decided they should have other designs under development in event the Bf 109 was outclassed by allied aircraft. Aeronautical engineer Kurt Tank submitted a series of designs and it was one featuring the BMW radial engine that attracted attention. Tank envisaged a robust aircraft able to withstand battle damage and operate from rough airstrips and to which the armament was integral to the design, not added almost as an afterthought. The Fw 190 first flew in June 1939 and began operational service in France in August 1941. It proved an immediate success, serving alongside the Bf 109 throughout the war. The problem for modern day warbird enthusiasts is that few are left. Around 20,000 were built during the war but not many survived. Most of the existing original aircraft were based with Jagdgeschwader (JG) 5 in Norway, avoiding the worst of the attrition from the late war air battles over Germany and the eastern front. In contrast, almost 34,000 Bf 109 aircraft were made up to the end of the war, the most of any fighter in history. Most of these original WW2 Focke‑Wulf aircraft are on static display, with very few, perhaps half a dozen in airworthy condition. Then there are replicas, thanks to a small German firm called Flugwerk which in 1997 began producing new-built aircraft based on original plans and some tooling and parts. Mayr’s aircraft was assembled in the US of Flugwerk repair parts and comprises about 90 per cent new construction and the rest original components. “Mine has the identity of a July 1944 aircraft and some of the parts of that aircraft. The reality is that most of the wreckage fits in a couple of big plastic containers I have in a factory near home,” he said. 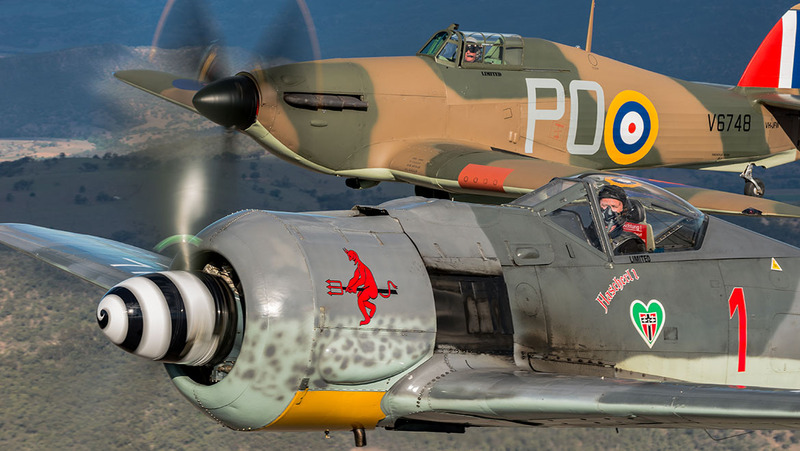 In contrast, most surviving P-51 Mustangs are original or mostly original as many survived the war and continued in frontline service, including in Australia. Mayr’s aircraft’s parent was found buried in Rheims, France, where it had apparently been stripped of usable parts and discarded during the war. Its German work number 173056 indicated it was constructed at the Focke-Wulf plant at Marienburg, Germany, in July 1944. However, this plant was destroyed in a bombing raid on October 9 1943. It’s thought sub-assemblies from 173056 were recovered from the ruins and transported to Cottbus for final assembly. The wreckage of aircraft 173056 was located in 1989 and acquired by US warbird enthusiast Don Hansen who began restoration in Baton Rouge, Louisiana in 2000. The restored aircraft first flew in the US on October 9 2011. While there are a few original parts, such as the tailwheel unit, the engine is not one of them. There are few original wartime BMW 801D‑2 14-cylinder radial engines or their spares remaining. So the next best thing is the Russian Ash-82T, licence-built in China. This is a 14-cylinder twin-row radial comparable in power, around 1,900 horsepower, and engine capacity, around 41-litres, to the original powerplant. This aircraft is the Fw 190-A8 version, produced from February 1944, a type likely to have been routinely encountered by allied aircraft in the vast air battles over northern Europe. Mayr’s aircraft – Australian registration VH-WLF – bears the colour scheme and markings of Luftwaffe ace Hans Dortenmann, although he never actually flew Focke‑Wulf 173056. Dortenmann shot down 38 aircraft, 16 over the Eastern Front and 22 over the Western Front, including six Mustangs. He survived the war, worked as an architect and died in 1973. Mayr said he had been looking for a Focke-Wulf 190 for some time. “It had always been my mission to at some point in my life at the very least to fly one and preferably own one,” he said. He nearly did a deal to buy an aircraft from Germany but that fell through. Some time later he saw an ad on Barnstormers, the US website of aircraft for sale. “I contacted Claus Colling, the founder of Flugwerk in Germany and asked him about this particular airframe. I spoke to a few different people around the world and everybody said this was one of the best if not the best still flying,” he said. Mayr committed to buy in November 2014. The aircraft was transported by ship via Panama in a pair of 40-foot shipping containers, arriving in July 2015. It was assembled by Hazair at Albury, where the aircraft is now hangered. First flight in Australia was on November 9 2015, with German pilot Klaus Plasa in the cockpit. 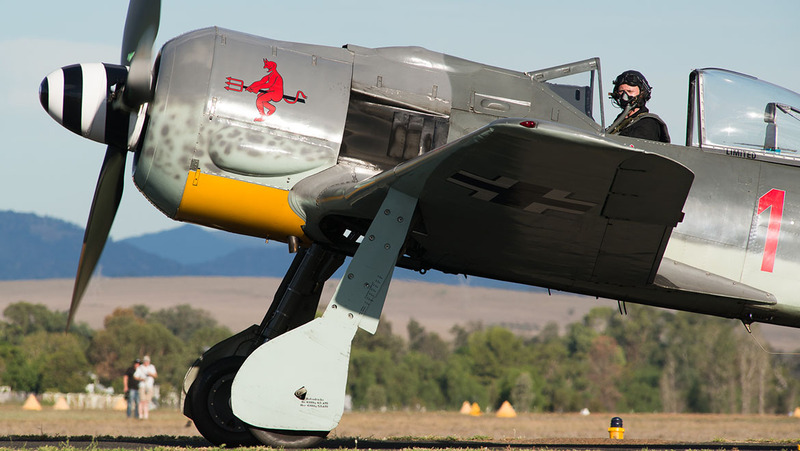 Plasa, a serving German air force officer, is the acknowledged world expert on flying the Focke-Wulfe Fw 190. He first flew this very same aircraft following its long restoration. Mayr, who lives in Melbourne, said Albury was the best location for his aircraft. “The main thing for me was to find a location where they had the ability to maintain an aircraft like that and an airfield from which I could operate it safely. Albury is very long and wide. You can land a 737 there if you have to,” he said. With a shiny new aircraft, Mayr’s next task was to fly it, guided by Plasa. “I looked to Klaus for guidance, him being the most experienced Focke-Wulf guy around. I have always tried to surround myself with very experienced people from whom I can learn,” he said. For his first flight, Mayr was on his own and he admits this was a little bit nerve wracking. “I wouldn’t have done it if I thought it wasn’t going to end well. I looked to Klaus for his advice and I said I expect you to stop me if you think I’m not ready for this,” he said. “Klaus is the ultimate professional. He never would have let me go if he thought I wasn’t ready. “We had done a little bit of flying training in a Harvard beforehand. I also own a Yak-50 which I reckon was better preparation for me personally but of course the Yak-50 is only a single seater. “So at least Klaus could see how I fly in the Harvard and he could judge my abilities. “The first flight was out of Albury. I prepared thoroughly and it all went smoothly. I went up and flew what I would call my standard profile for a first flight in a single-seater as I did with the Yak. I did a series of shallow turns to the left and right, then steep turns to the left and right, then stalled the aircraft to determine an approach speed. “I climbed to altitude and stalled it clean and stalled it dirty and from that I can determine an approach speed – just multiply the stall speed by 1.3 so I know what I’m looking for on final. He has flown some gentle aerobatics in the Focke-Wulf. “For such a heavy aeroplane it has a fairly impressive roll rate. It is relatively light on the controls. It is more manoeuvrable than I was expecting it to be,” he said. Mayr now has about 50 hours on this aircraft, some of it at airshows where VH-WLF is becoming a regular. 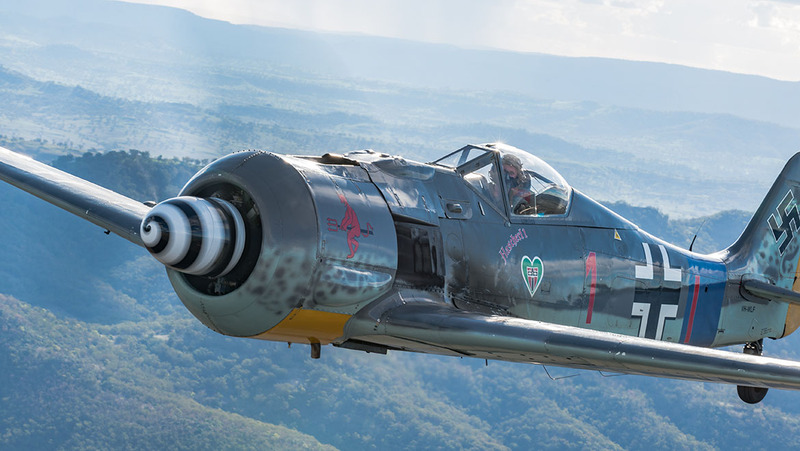 Fifty hours possibly makes him the second most experienced Focke‑Wulf 190 pilot in the world, behind Klaus Plasa. “You have about an hour’s worth of fuel and then you want to be back on the ground. An hour is pretty tiring,” he said. “It is a demanding aircraft to fly well and I try to fly it well. I will give myself a thorough pre-brief and debrief. I will take notes after every flight just to criticise my flight and see what I can do better to try and improve. “There are lots of little things that make it challenging. You have to wear an oxygen mask which is hooked up to a ram air supply. Below about 80kt it’s hard to breath in and above 80kt it’s hard to breathe out. In preparing for the Fw 190, Mayr also learned how to parachute. “I do definitely fly with a parachute. It would be pretty hard getting out because it is such a tight cockpit,” he said. “That was all part of my preparation for the Wulf. I wanted to have the mindset that if anything necessitated a bailout, I wouldn’t hesitate. Mayr does acknowledge the Focke-Wulf, with its weight and high wing loading, has glide characteristics just slightly better than a falling brick. 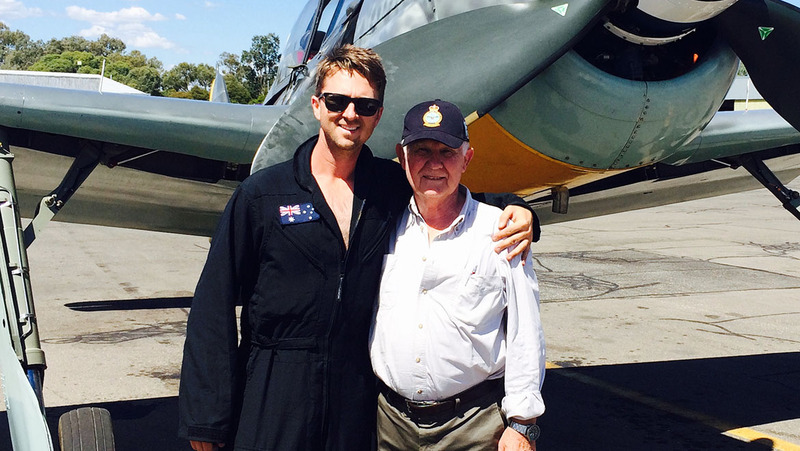 He says his favourite moment in owning the Focke-Wulf occurred at the recent Scone Airshow. On the Saturday, he flew a display in conjunction with Hawker Hurricane VH-JFW. But on Sunday, the display was cancelled because of a strong crosswind. “We were sitting in possibly the two rarest aircraft in the southern hemisphere. It just wasn’t worth the risk,” he said. And then an elderly blind man started feeling around the parked aircraft. It turned out he was a fellow aficionado of German equipment and the Focke-Wulf 190 was his favourite aircraft. He had lost his sight in his 20s. “He had been driven there by his family from Taree just to be near the Focke-Wulf. It nearly brought a tear to my eye,” he said. Mayr says his short-term challenge is to master his Focke-Wulf but he has other plans involving German aircraft. First off he has to oversee final assembly then test fly his Fokker Dr.1. Yes he also owns a replica of the World War 1 triplane in which Manfred Albrecht Freiherr Von Richthofen – the Red Baron – achieved his final 19 of 80 kills. It was also the aircraft in which he died, shot down by Australian soldiers in France on April 21 1918, a century ago. The aircraft is based in Caboolture, Queensland with the Australian Vintage Aviation Society. “That only arrived in the country a month or so ago so it is still being assembled. We are trying to get this jigger up and running in time for the airshow up there on April 21 and 22,” he said. He also wants an SG38 ‘primary glider’ of the type used in Germany for initial basic flight training. Between the wars, Germany was forbidden to have its own air force but saw a time when it would have an air force, for which it would need aircrew. Glider training was conducted as a type of youth activity. Video on Youtube shows groups of strapping young Germans launching gliders by running downhill and towing the aircraft into the air on long ropes. “It is just a very basic aeroplane. I would love to own one of them and in fact that is probably the next aircraft that I will buy. You can get modern replicas. You can buy them as a kit, a very quick-build kit because there’s not much to them,” Mayr said. Then there’s the Messerschmitt 262, the world’s first practical jet fighter, fielded by Germany late in WW2. This aircraft far surpassed anything on the allied side but it was too late and too few in number to make a difference. “In the USA the Collings foundation have a two-seat Messerschmitt 262 which you can go and do a type rating on. That is on my bucket list. I am aiming to get over there in September and do a type rating, which would be pretty awesome,” he said. And finally, there’s the Messerschmitt Me 163 Komet, the world’s only operational rocket-powered fighter, hurriedly developed towards the end of the war to attack bomber formations. This diminutive aircraft was blindingly fast, exceptionally dangerous for its pilots and mostly unsuccessful as a bomber interceptor. But it was an example of Germany’s stunning technological achievements late in the war. There are a number of examples in museums around the world, including the Australian War Memorial. None have flown under rocket power since the dying days of WW2 and none of the surviving examples can still fly. However, one was made in France as a glider and among those who have tried it out was Klaus Plasa. “I am determined o build a Messerschmitt 163 before I die but it won’t be rocket-powered obviously because you can’t get rockets easily. I have had some discussions with a guy who wants to build one for me,” Mayr said. That will either be a glider or one powered by a jet turbine engine. “If we go the turbine route it becomes a little more challenging because obviously you have to find somewhere for the intakes which the rocket powered version didn’t need,” he said. Building the aircraft as a glider would still be within the spirit of the concept as original Komets only had three and a half minutes of rocket power to get them to altitude, after which they glided home.